The one hour unique Science Show is a professionally designed, entertaining show and a perfect way to engage vacation care and oshc children with awesome and mysterious magic tricks while they learn the science behind the magic. The Science show is both educational and entertaining. Almost everything in this show can be replicated with simple household items. The children will be able to show these amazing magic tricks to their friends and family and then explain the science behind the magic placing the child in the position of teacher which is wonderful for building confidence. The Science Magic Show is very interactive allowing the children to experience the scientific principals with ‘hands on’ real life demonstrations that will inspire all the children to investigate and use the scientific methods explained throughout the show. My name is Glen Rhodes and I am a professional, experienced, qualified trainer and educator (Cert IV (cat 2)) as well as an experienced entertainer and magician who knows how to engage, educate and entertain children. I hold a current ‘Blue card’ for child related employment as well as $20M public liability insurance and have a risk assessment for the show. I have purposely decided that I did not want to encourage the mixing of chemicals, use of fire, gases or explosives like some other science incursions. This is a mess free, chemical free, explosion free, 100% safe and responsible OSHC or vacation care incursion for the children. 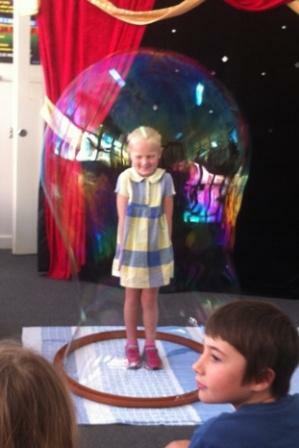 The one hour science magic show cost is $375 and there is no limit on the number of children. A shorter 45 minute show is available for $350 but this does not include the ever popular ‘child in bubble’ routine. School Holiday periods are very popular and I can only accommodate two Vacation or OSHC centres per day, so please book early to secure your preferred time and date for the unique Science Magic Show.